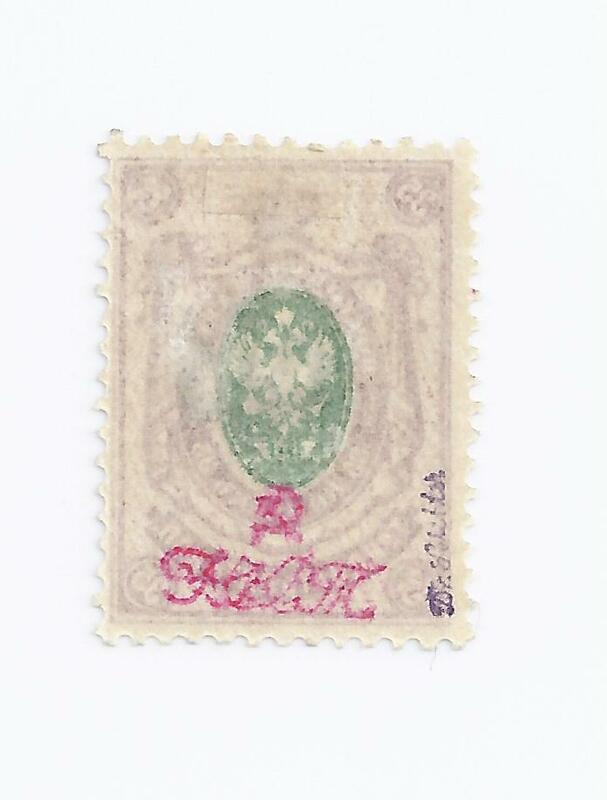 Trevor Pateman's Philately Blog: Beware This Mark on Ukraine Tridents! Back in 2001, one of our most knowledgeable and careful living philatelists, Alexander Epstein, published an article in Ukrainian Philatelist (v 49, n 1) which alerted collectors to a forgery of a Soviet export mark appearing on the back of loose Trident stamps. 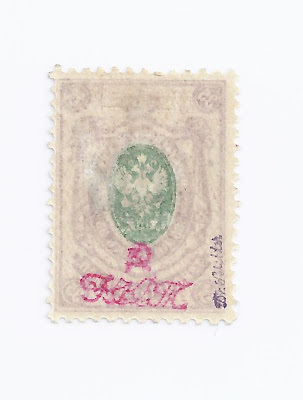 This mark is illustrated above; a genuine mark of this character exists and was used in the 1920s but only on items of postal history; a significantly smaller mark was used on stamps. The forgery of the large mark appeared in the 1950s and was applied to the back of stamps with forged Trident overprints. Of course, it's possible that it was also applied to stamps with genuine overprints. Dr Seichter has signed the above stamp as genuine, though it isn't. 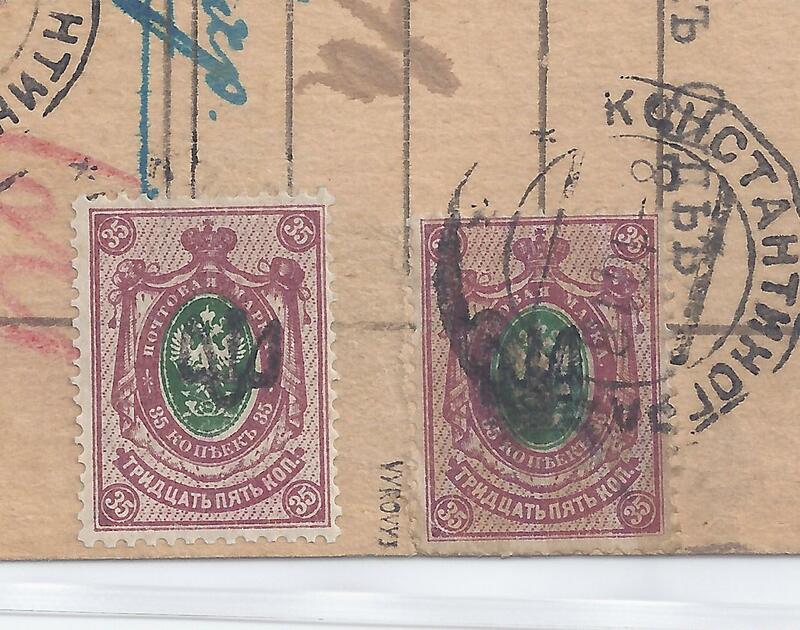 Dr Seichter seems to have taken the mark to be genuine and thus was puzzled by stamps with what appeared to be doubtful overprints. He concluded that, in general, the stamps were Reprints. He wrote about the problem in a little pamphlet, "Ukraine: Falschung oder unbekannte Typen? Kritische Betrachtungen uber Lokalausgaben 1918/20" (1960). I also illustrate a picture of the the mint stamp alongside the used copy which appears on the one known MTF with Konstantynohrad Trident. Look at the right wing on both stamps and you can see that on the mint forgery, the wing inclines at a greater angle to the vertical spike of the Trident than does the wing on the genuine stamp. The illustration in Bulat's catalog (page 127) correctly captures the angle of inclination of the right wing. 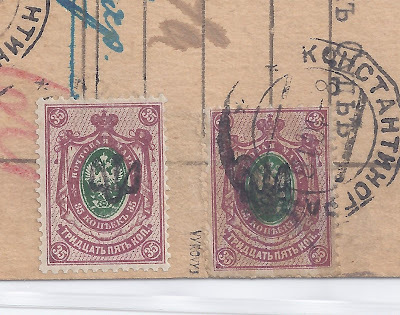 On my next Blog, I will illustrate a batch of stamps with the large export mark and forged tridents which are much easier to see are forgeries than this Konstantynohrad example.